The older adult population is booming in the United State and across the globe. With this boom comes an increase in the number of older adults who experience psychological disorders. Current estimates suggest that about 20% of older persons are diagnosable with a mental disorder: Personality disorders are among the most poorly understood, challenging, and frustrating of these disorders among older adults. 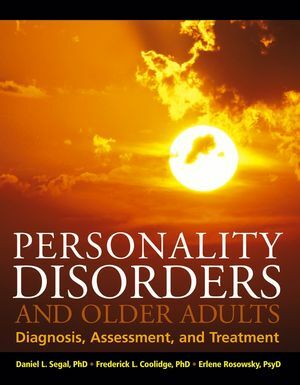 This book is designed to provide scholarly and scientifically-based guidance about the diagnosis, assessment, and treatment of personality disorders to health professionals, mental health professionals, and senior service professionals who encounter personality-disordered or "difficult" older adults. DANIEL L. SEGAL, PhD, is an Associate Professor in the Department of Psychology at the University of Colorado at Colorado Springs. He teaches courses in clinical psychology, conducts research on mental health and aging, and trains students in clinical geropsychology at the CU Aging Center. FREDERICK L. COOLIDGE, PhD, is a Professor in the Department of Psychology at the University of Colorado at Colorado Springs. His research focuses on behavioral genetics and personality disorders across the lifespan. ERLENE ROSOWSKY, PsyD, is an Assistant Clinical Professor in Psychology in the Department of Psychiatry at Harvard Medical School and is the Director of the Center for Mental Health and Aging at the Massachusetts School of Professional Psychology. Dr. Rosowsky writes a regular column for the Journal of Retirement Planning. Chapter 1. Introduction to Personality Disorders and Aging. Mental Health and Aging: The Big Picture. Overview of Personality and Personality Disorder. History of the Personality Disorder Category. Challenges Associated with Personality Disorder Psychopathology. Chapter 2. The Odd and Eccentric (Cluster A) Personality Disorders and Aging. Cluster A Personality Disorders: Paranoid, Schizoid, and Schizotypal. Chapter 3. The Dramatic, Emotional, and Erratic (Cluster B) Personality Disorders and Aging. Cluster B Personality Disorders: Antisocial, Borderline, Histrionic, and Narcissistic. Chapter 4. The Fearful or Anxious (Cluster C) Personality Disorders and Aging. Cluster C Personality Disorders: Avoidant, Dependent, and Obsessive-Compulsive. Chapter 5. Other Personality Disorders and Aging: Sadistic, Self-Defeating, Depressive, Passive-Aggressive, and Inadequate. Personality Disorders in DSM-III-R Appendix A and in DSM-IV-TR Appendix B.
Sadistic Personality Disorder: DSM-III-R Appendix A. Self-Defeating Personality Disorder: DSM-III-R Appendix A.
Depressive Personality Disorder: DSM-IV-TR Appendix B.
Passive-Aggressive Personality Disorder: DSM-IV-TR Appendix B. Inadequate Personality Disorder—A Manifestation of Frontal Lobe Syndrome? Chapter 6. Epidemiology and Comorbidity. Epidemiology of Personality Disorders in Later Adult Life. The Debate about Stability versus Change for the Personality Disorders. Course and Prognosis for the Personality Disorders. Comorbidity of Personality Disorders with Clinical Disorders and with other Personality Disorders. Chapter 7. Theories of Personality Disorders: Cognitive, Psychoanalytic, and Interpersonal. Cognitive Theories of Personality Disorders. Psychoanalytic Theories of Personality Disorders. Provinces and Instincts of the Psyche. Neuroses, Psychoses, and Personality Disorders. A Brief Note about the Humanistic Approach. Interpersonal Theories of Personality Disorders. Horney’s Interpersonal View of the Personality, Personality Disorders, and the Basic Conflict. The Resolution of Neurotic Conflict. Horney, Feminist Psychology, and Humanism. Horney, Aging, and Personality Disorders. Chapter 8. Theories of Personality Disorders: Evolutionary and Neurobiological. Evolutionary Theories of Personality Disorders. Basic Concepts of Evolutionary Theory. Application to Antisocial, Histrionic, Narcissistic, Dependent, and Avoidant Personality Disorders. Application to Borderline Personality Disorder. Application to Paranoid Personality Disorder. Application to Schizoid, Schizotypal, and Avoidant Personality Disorders. Neurobiological Theories of Personality Disorders. The Clinical Interview of the Patient. Personality Diagnostic Questionnaire-Fourth Edition Plus. Application of Personality Inventorieswith Older Adults. Structured Interview for DSM-IV Personality. Diagnostic Interview for DSM-IV Personality Disorders. Application of Semi-Structured Interviews with Older Adults. Chapter 10. Treatment: General Issues and Models. Core Features of Personality Disorder Affecting Treatment. Rigidity of Character Structure and Limited Repertoire. Comorbidity of Axis I and Axis II Disorders. Guideposts for Treatment Planning and Goal Setting. Understanding the Phenomenology of Personality Disorders and Helping Guide Treatment. Chapter 11. The “Goodness of Fit” Model and Its Implications for Treatment. Utility of a Personality Trait Model. Implications of the Goodness of Fit Model for Designing a Treatment Plan. "The foreword describes this book as the best of its kind in the field of personality disorders of the elderly. I fully agree and recommend it to practitioners, researchers, and educators. It should be required reading for graduate students in psychology and for those preparing for careers in mental health. It really is an outstanding book!"